Absurdism is a philosophical perspective which holds that the efforts of humanity to find meaning or rational explanation in the universe ultimately fail (and, hence, are absurd) because no such meaning exists, at least to human beings. The word absurd in this context does not mean "logically impossible," but rather "humanly impossible." Absurdism implies a tragic tone and feelings of frustration that arise out of the contradiction between the human quest for the meaning of life and its inaccessibility. Absurdism is related to existentialism and nihilism, and the term has its roots in the nineteenth century Danish philosopher, Søren Kierkegaard. Absurdism as a philosophical position was born out of the Existentialist movement when the French philosopher and writer Albert Camus broke from that philosophical line of thought and published his manuscript The Myth of Sisyphus. The aftermath of World War II provided the social environment that stimulated absurdist views and allowed for their development, especially in the devastated country of France. Kierkegaard designed the relationship framework based in part on how a person reacts to despair. Absurdist philosophy fits into the 'despair of defiance' rubric. What is the Absurd? It is, as may quite easily be seen, that I, a rational being, must act in a case where my reason, my powers of reflection, tell me: you can just as well do the one thing as the other, that is to say where my reason and reflection say: you cannot act and yet here is where I have to act…. The Absurd, or to act by virtue of the absurd, is to act upon faith … I must act, but reflection has closed the road so I take one of the possibilities and say: This is what I do, I cannot do otherwise because I am brought to a standstill by my powers of reflection. In one of his famous works, Fear and Trembling, Kierkegaard uses the example of God's command to Abraham to sacrifice his son Isaac in the Book of Genesis. Just as Abraham was about to kill him, an angel stopped Abraham from doing so. 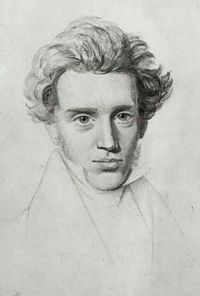 Kierkegaard believes that through the virtue of the absurd, Abraham, defying all reason and ethical duties ("you cannot act"), regained his son and reaffirmed his faith ("where I have to act"). However, it should be noted that in this particular case, the work was signed with the pseudonym Johannes de Silentio. Another instance of absurdist themes in Kierkegaard's work is found in The Sickness Unto Death, which is signed by the pseudonym Anti-Climacus. In his examination of the forms of despair, Kierkegaard examines the type of despair known as defiance. Kierkegaard describes how such a man would endure such a defiance and identifies the three major traits of the Absurd Man, later discussed by Albert Camus: a rejection of escaping existence (suicide), a rejection of help from a higher power, and acceptance of his absurd (and despairing) condition. According to Kierkegaard in his autobiography The Point of View of My Work as an Author, most of his pseudonymous writings are not necessarily reflective of his own opinions. Nevertheless, his work anticipated many absurdist themes and provided its theoretical background. 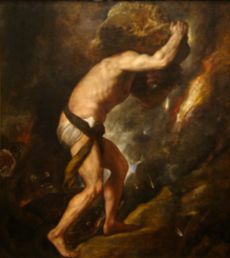 Although the notion of the 'absurd' is pervasive in all of the literature of Albert Camus, The Myth of Sisyphus is his chief work on the subject. In it, Camus considers absurdity as a confrontation, an opposition, a conflict, or a "divorce" between two ideals. Specifically, he defines the human condition as absurd, as the confrontation between man's desire for significance/meaning/clarity and the silent, cold universe. He continues that there are specific human experiences that evoke notions of absurdity. Such a realization or encounter with the absurd leaves the individual with a choice: suicide, a leap of faith, or acceptance. He concludes that acceptance is the only defensible option. For Camus, suicide is a "confession" that life is simply not worth living. It is a choice that implicitly declares that life is "too much." Suicide offers the most basic "way out" of absurdity, the immediate termination of the self and self's place in the universe. The absurd encounter can also arouse a "leap of faith," a term derived from one of Kierkegaard's early pseudonyms, Johannes de Silentio (but the term was not used by Kierkegaard himself,) where one understands that there is more than the rational life (aesthetic or ethical). To take a "leap of faith," one must act with the "virtue of the absurd" (as Johannes de Silentio put it), where a suspension of the ethical may need to exist. This is not the dogmatic "faith" that we have come to know; Silentio would call that an "infinite resignation" and a false, cheap "faith." This faith has no expectations but is a flexible power propelled by the absurd. Camus considers the leap of faith as "philosophical suicide." Camus, like Kierkegaard, rejects both this and physical suicide. Lastly, man can choose to embrace his own absurd condition. According to Camus, man's freedom, and the opportunity to give life meaning, lies in the acknowledgment and acceptance of absurdity. If the absurd experience is truly the realization that the universe is fundamentally devoid of absolutes, then we as individuals are truly free. "To live without appeal," as he puts it, is a philosophical move that begins to define absolutes and universals subjectively, rather than objectively. The freedom of man is, thus, established in man's natural ability and opportunity to create his own meaning and purpose, to decide himself. The individual becomes the most precious unit of the existence, as he represents a set of unique ideals that can be characterized as an entire universe by itself. Camus states in The Myth of Sisyphus: "Thus I draw from the absurd three consequences, which are my revolt, my freedom, and my passion. By the mere activity of consciousness I transform into a rule of life what was an invitation to death, and I refuse suicide." The Myth of Sisyphus is a philosophical essay by Albert Camus. It comprises about 120 pages and was published originally in 1942 in French as Le Mythe de Sisyphe; the English translation by Justin O'Brien followed in 1955. In the essay, Camus introduces his philosophy of the absurd: man's futile search for meaning, unity and clarity in the face of an unintelligible world devoid of God and eternity. Does the realization of the absurd require suicide? Camus answers: "No. It requires revolt." He then outlines several approaches to the absurd life. The final chapter compares the absurdity of man's life with the situation of Sisyphus, a figure of Greek mythology who was condemned to repeat forever the same meaningless task of pushing a rock up a mountain, only to see it roll down again. The essay concludes, "The struggle itself … is enough to fill a man's heart. One must imagine Sisyphus happy." The work should be seen in relation to other works by Camus: the novel The Stranger (1942), the play Caligula (1945), and especially the essay The Rebel (1951) which was completed prior to his death in 1960 due to a car accident. According to Absurdism, humans historically attempt to find meaning in their lives. For some, traditionally, this search follows one of two paths: either concluding that life is meaningless and that what we have is the here-and-now; or filling the void with a purpose set forth by a higher power, often a belief in God or a religion. However, even with a spiritual power as the answer to meaning, another question is posed: What is the purpose of God? Kierkegaard believed that there is no human-comprehensible purpose of God, making faith in God absurd. For some, suicide is a solution when confronted with the futility of living a life devoid of all purpose, as it is only a means to quicken the resolution of one's ultimate fate. For Albert Camus, in The Myth of Sisyphus, suicide is not a worthwhile solution because if life is veritably absurd, then it is even more absurd to counteract it; instead, we should engage in living and reconcile the fact that we live in a world without purpose. For Camus, the beauty that people encounter in life makes it worth living. People may create meaning in their own lives, which may not be the objective meaning of life but still provides something for which to strive. However, he insisted that one must always maintain an ironic distance between this invented meaning and the knowledge of the absurd lest the fictitious meaning take the place of the absurd. Camus introduced the idea of "acceptance without resignation" and asked if man can "live without appeal," defining a "conscious revolt" against the avoidance of absurdity of the world. In a world devoid of higher meaning, or judicial afterlife, man becomes absolutely free. It is through this freedom that man can act either as a mystic (through appeal to some supernatural force) or an absurd hero (through a revolt against such hope). Henceforth, the absurd hero's refusal to hope becomes his singular ability to live in the present with passion. Relationship between existentialism, absurdism, and nihilism can be illustrated as follows. This is a simplified comparison to illustrate basic difference among them. Real arguments in each position are far more complex than this illustrative chart. ↑ 1.0 1.1 Johannes de Silentio, in Søren Kierkegaard and Alastair Hannay, Fear and Trembling (Harmondsworth, Middlesex, England: Penguin Books, 1985, ISBN 0140444491). ↑ Alexander Dru, The Journals of Søren Kierkegaard (Oxford University Press, 1938). ↑ Albert Camus, Myth of Sisyphus and Other Essays (New York: Vintage Books, 1991, ISBN 0679733736). ↑ 5.0 5.1 5.2 5.3 Alastair Hannay and Gordon Daniel Marino, "The Kierkegaardian Leap" in The Cambridge Companion to Kierkegaard (Cambridge: Cambridge University Press, 1998). Kierkegaard, Søren. Fear and Trembling, And The Sickness Unto Death. Garden City, NY: Doubleday, 1954. Kierkegaard, Søren, and Walter Lowrie. The Sickness Unto Death. Princeton: Princeton University Press, 1941. Selections from the Writings of Kierkegaard, Translated by L.M. Hollander. Søren Kierkegaard, Stanford Encyclopedia of Philosophy. This page was last modified on 28 January 2019, at 20:07.